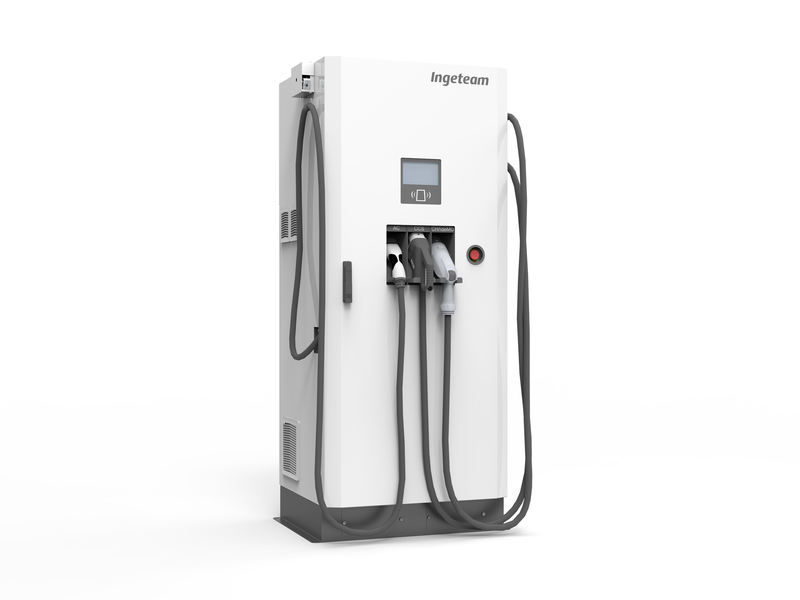 Ingeteam's INGEREV RAPID 50 is the company's latest multi-standard rapid charge model for the INGEREV electric vehicle product range. INGEREV RAPID 50 is compatible with the CHAdeMO, CCS, and Type 2 AC standards, making it a solution for charging all types of electric vehicles. It is available in three different models (Trio, Duo, and One), depending on the charging standard required. The INTGEREV RAPID 50 offers the possibility of simultaneous AC and DC charging. The INGEREV RAPID 50 features advanced local and remote communication capabilities via Ethernet, 3G, and Wi-Fi for integration in local and/or remote control centers, payment platforms, and charge managers using different versions of the OCCP protocol (customized or standard). Its 7" TFT color touch screen improves the user interface and also offers an advertising option. The charger design combines ease of use with maintenance simplicity. Its sturdy steel enclosure guarantees exceptional resistance in even the most adverse ambient conditions. The Trio model is compatible with all three existing charging standards, CHAdeMO, CCS, and AC, the Duo model includes CHAdeMO and CCS, while the One model only includes CCS.